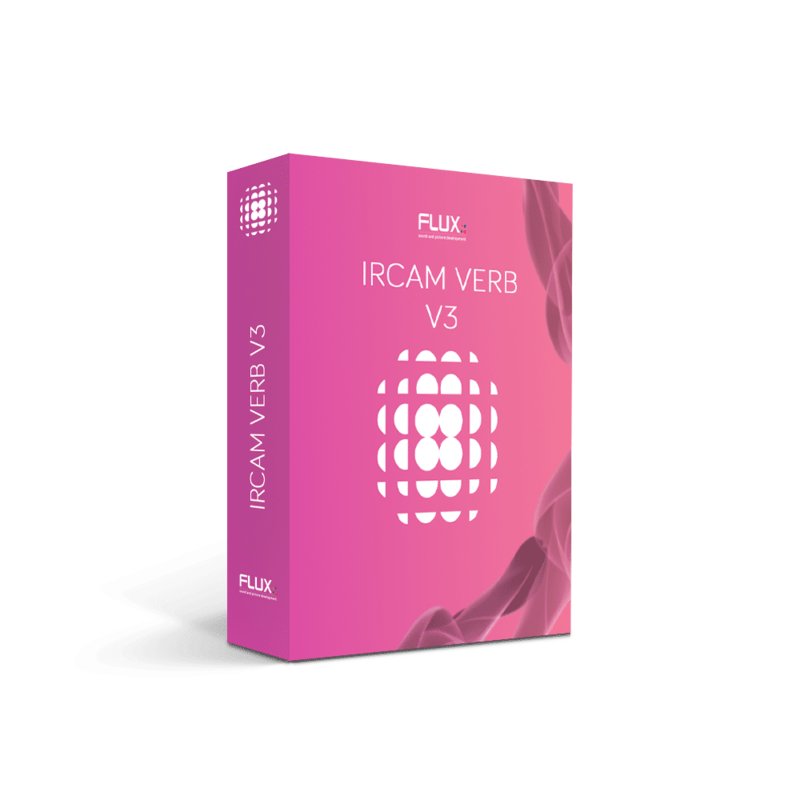 Ircam Verb v3 provides ten input and output channels presenting the option for reverberation processing in multi-channel and surround formats, including Dolby Atmos. 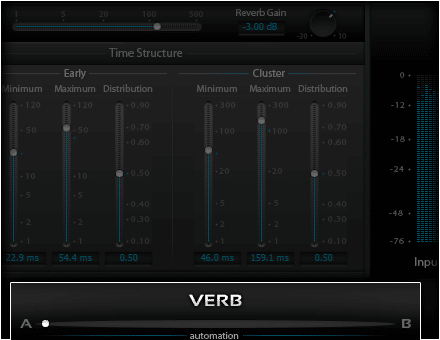 With a built in Input/Output (I/O) routing matrix instant flexibility is provided for configuring the I/O in relation to the physical audio monitoring in the control room. 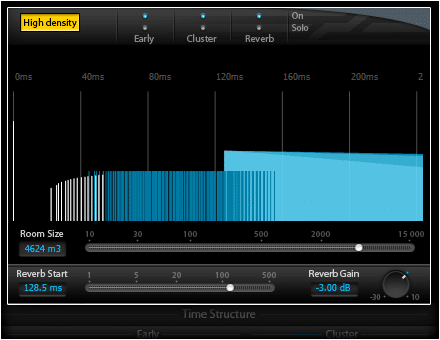 Graphical representation of the Early, Cluster and Reverb with controls for High density (standard/high density reverberation engine), Early, Cluster and Reverb On/Solo controls, and Room Size, Reverb Start and Reverb Gain controls. 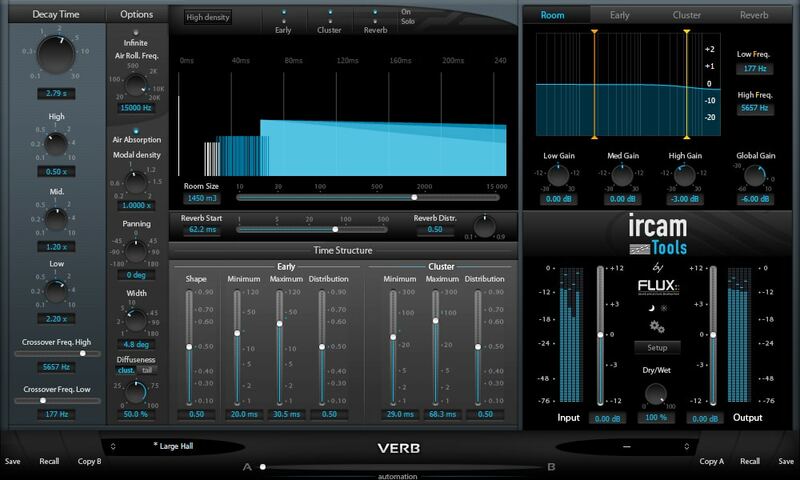 Creative reverb options including; Infinite (“deep-freezing” the reverb). Air Absorption/Roll Freq. simulates the frequency dependent air absorption. Modal Density, the frequency “smoothness” of the Verb engine. Panning, virtual source panning-direction offset. Width, panning width. Diffuseness, the directional information of the reverberation. 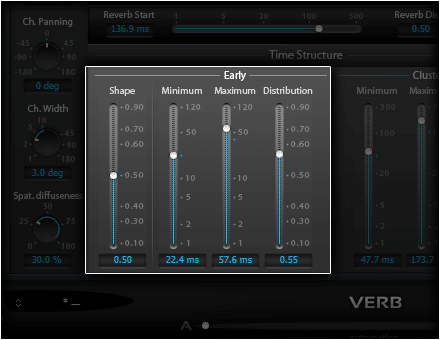 Early Time Structure controls, with Early shape controlling the amplitude rise or fall of early reflections, Early Min controlling the time at which the early reflections start to appear, Early Max controlling the time at which the early reflections cease to appear and Early Distribution controlling the way early reflections are scattered in time. Cluster Time Structure controls, with Cluster Min controlling the time at which the Cluster start to appear, Cluster Max controlling the time at which the Cluster cease to appear and Cluster Distribution controlling the way the Cluster is scattered in time. 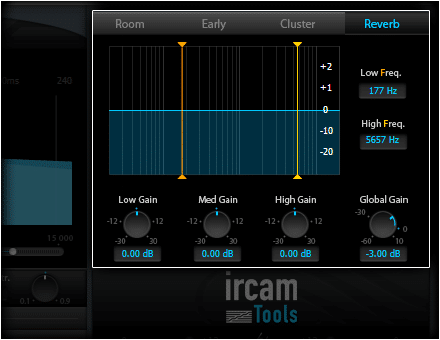 IRCAM State of the art room acoustics simulation and reverberation, advanced perceptive models providing an intuitive user experience. Channel Routing Matrix for routing the I/O channels depending on the actual control room monitor setup (for surround/multichannel use). 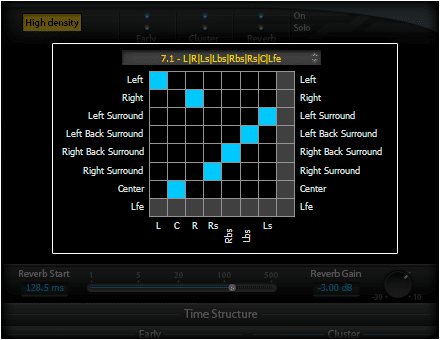 Input/Output Gain (-/+ 12 dB) for adjusting the levels before and after processing. 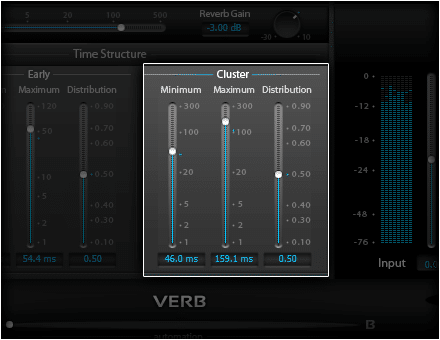 Graphical representation of Early, Cluster and Reverb. Room Size. High density setting for selecting standard/high density reverberation engine. A set of 3-band filters applied to each part of the time structure for fine tuning the reverberation characteristics. Air Absorption/Roll Freq. 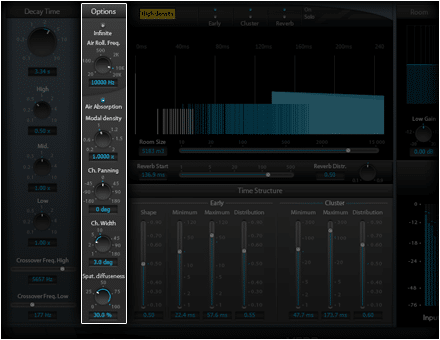 simulates the frequency dependent air absorption. Diffuseness, the directional information of the reverberation.